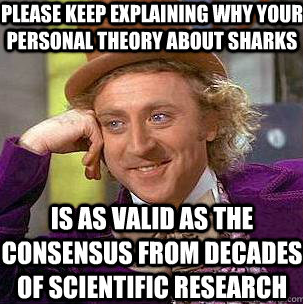 I'm not sure whether Shark Week was ever really a great moment in science communication with the public. But after last week's Megalodon special and fake shark facts on Discovery Channel, we know for sure that sharks have joined UFOs in the annals of Great Pseudoscience. Shark researcher David Shiffman breaks it down for you. The National Marine Fisheries Service showcased important science and management with ” #NOAAsharkweek .” Ed Yong posted the highlights of his past coverage of shark science and conservation issues, as did Deep Sea News. Deep Sea News also published a variety of awesome new content, including “5 cool things about sharks you won’t see on TV this week,” a powerful post by Alex Warneke about why it matters what content Discovery includes in their specials, a fascinating post by Holly Bik on the microbiome of sharks, a post on the physics of a SharkNado by my favorite physical oceanographer Kim Martini, and a list of shark-themed drinks from Craig. The Scientific American Blog Network had a lot of great shark science stories as well, with posts by Jason at Thoughtful Animal, John at Extinction Countdown, Darren at Tetrapod Zoology, and even Bora himself. PLoS blogs covered it. Even technology sites like Mashable got in on the shark action. While a lot of negative attention has rightfully focused on “Megalodon: the monster lives,” much of the rest of Shark Week 2013 was also troubling (see my full breakdown in Wired). One particularly nonsensical documentary was “Sharkpocalypse,” a title so bad that the hosts mocked it during the show. The content wasn’t much better. This documentary claimed that shark “attacks” are increasing because we killed too many sharks so now there are too many seals so there are too many sharks. Huh? Probably the worst part, though, was when Discovery Channel started crowing about how great it was that they had convinced lots of people that Megalodon still exists. Shiffman includes this helpful graphic, showing that almost 75% of people polled think that Megalodon is still alive — despite what scientists say. So basically, a network devoted to science education is trumpeting its ability to persuade people that pseudoscience is truth. Oh, Shark Week. You are only one step removed from Ghostfacers.